No other product offers the same degree of safety, speed of operation, flexibility or efficiency that a Loading Bay Lift Table provides. Whatever the vehicle, whatever the load – your loading bay will be prepared and ready for work. Enhance your loading bay with an Edmolift Loading Bay Lift Table. Improved safety, faster vehicle turn-a-rounds and increased productivity are just some of the advantages of an Edmolift installation. Our team are specialists who provide an uncompromised level of service for our clients. However, we excel when dealing directly with architects and building contractors. Our technical knowledge, experience of civil works, electrical detailing, prompt and accurate open line communication and project management is unsurpassed. Catering giant Compass Group uses this Edmolift TS2000BLL Lorry Loader at its training centre in Crawley. 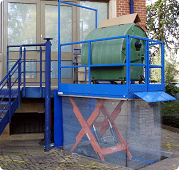 The lift is used for both goods in and waste out. A fixed height dock was in operation previously but it didn’t provide the flexibility the company required. Now vehicles of any height and type can be loaded and off loaded. The lift can also be used to transfer loads from ground level onto the dock.